GreenClean Liquid Bacteria contains several strains of beneficial bacteria ideal for breaking down and digesting waste commonly found in ponds. GreenClean Liquid Bacteria can be used to help establish new ponds, as well as to re-establish ponds after major overhauls, or spring time start-ups. Apply at least once a month to help support pristine healthy pond water, for overstocked or heavy organic loads, use weekly. If algae is already present, use GreenClean Granular to kill the algae, wait 48 hours then apply GreenClean Liquid Bacteria to bring the pond back into balance. Apply 1 cup when water quality & clarity are poor. Begin maintenance treatment the following week. 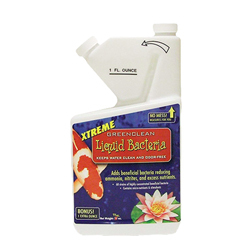 Add GreenClean Liquid Bacteria to pond or biological filter area. If a shock treatment is needed, apply directly to pond.